Jennifer Egan's spellbinding novel circles the lives of Bennie Salazar, an ageing former punk rocker and record executive, and Sasha, the passionate, troubled young woman he employs. Although Bennie and Sasha never discover each other's pasts, the reader does, in intimate detail, along with the secret lives of a host of other characters whose paths intersect with theirs, over many years, in locales as varied as New York, San Francisco, Naples, and Africa. We first meet Sasha in her mid-thirties, on her therapist's couch in New York City, confronting her long-standing compulsion to steal. Later, we learn the genesis of her turmoil when we see her as the child of a violent marriage, then a runaway living in Naples, then as a college student trying to avert the suicidal impulses of her best friend. We meet Bennie Salazar at the melancholy nadir of his adult life-divorced, struggling to connect with his nine-year-old son, listening to a washed up band in the basement of a suburban house-and then revisit him in 1979, at the height of his youth, shy and tender, revelling in San Francisco's punk scene as he discovers his ardour for rock and roll and his gift for spotting talent. We learn what became of his high school gang-who thrived and who faltered-and we encounter Lou Kline, Bennie's catastrophically careless mentor, along with the lovers and children left behind in the wake of Lou's far flung sexual conquests and meteoric rise and fall. 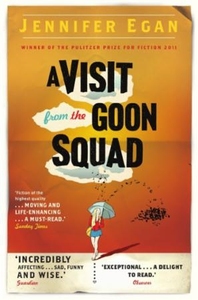 A Visit from the Goon Squad is a book about the interplay of time and music, about survival, about the stirrings and transformations set inexorably in motion by even the most passing conjunction of our fates. In a breathtaking array of styles and tones ranging from tragedy to satire to Powerpoint, Egan captures the undertow of self-destruction that we all must either master or succumb to; the basic human hunger for redemption; and the universal tendency to reach for both-and escape the merciless progress of time-in the transporting realms of art and music. Sly, startling, exhilarating work from one of our boldest writers.